Portland-area grain exporters, already feeling the pinch of a weak export market, say a proposed $150 million grain elevator 40 miles north of Portland will siphon business from other ports. While the Port of Longview project has been the subject of speculation for three years, several recent developments brought the new grain facility closer to reality. The Columbia River port has spent the last three years working to prepare a site and seal a lease agreement with EGT Development Corp., a joint venture between St. Louis-based grain company Bunge Ltd. and Japanese trading house Itochu Corp., on the estimated $150 million grain export facility. It would be the first grain elevator built in the United States in 25 years, according to the port. The process has been held up by the need to acquire several parcels of land. The final piece fell into place in February, when the port struck a $2.1 million deal to buy six acres from RSG Forest Products to extend a rail line to the site. The federal government also bolstered the plan last week when it announced the final round of funding for the ongoing project to deepen the Columbia River shipping channel by three feet. The added depth will allow larger grain ships to call area ports, including Longview. Port of Longview Executive Director Ken O'Hollaren hails the project as a potential economic engine for Longview that will create 50 full-time jobs and put the port back into the grain business for the first time since 1989. But that's likely to come at the expense of the four other companies that operate grain export terminals along the Columbia and Willamette rivers. "Outside of the construction of it, (the Longview grain elevator) is not going to create jobs," said Arne Schaufler, general manager of CLD Pacific Grain LLC, a joint venture between Cargill Inc. and Louis Dreyfus Corp., that operates two grain export facilities along the Willamette in Portland. "It will shift jobs from one port to another, or maybe several ports to the other. That's a zero-sum game." The addition of another player in the grain business might taste even more sour today, at a time when grain shipments are down about 30 percent in the region. 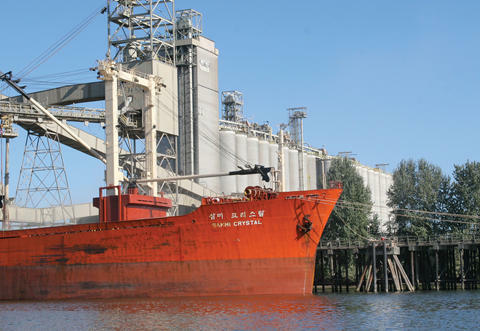 Through April, 133 grain ships have called on the four companies in the region: CLD, Columbia Grain Inc., Kalama Export Co. and United Harvest LLC. That's a 30 percent drop from the 192 grain ships from the same time last year, when the region's grain exporters saw an unusually high growth rate. But this year's ship calls are still lower than previous years when growth was tempered, such as the 154 ship calls in 2007 and the 148 in 2006. The principal agricultural export commodity in the region is white wheat, and industry exports believe the region's existing grain facilities in Portland, Vancouver and Kalama have more than enough capacity to handle those volumes. "We don't need another elevator to handle white wheat off this coast," said Dave Gordon, general manager of Northwest Grain Growers Inc., a Walla Walla, Wash.-based cooperative that handles and ships grain from 19 facilities bound for Portland-area export facilities. Wheat is Oregon's largest export after electronic components. Combined, Oregon and Washington exported more than $4.4 billion of wheat in 2008, capturing 14 percent of the market, according to the U.S. Census. Both Gordon and O'Hollaren believe it's possible the new grain terminal will attract export cargo like corn and soybeans that is now shipped through the Gulf of Mexico. "The facility in Longview in my opinion will not bring incremental volumes in either beans, corn or wheat to the West Coast," Schaufler said. Officials with Bunge would only confirm that the company is in discussions regarding a new grain terminal. O'Hollaren gave no timetable for when a deal with EGT might be reached, but said the only detail that remains is finalizing a lease.